The e-commerce titan and Seattle’s biggest single property-tax payer is on a collision course with a majority of the City Council over the proposed head tax. Amazon has played hardball with plenty of municipalities, but here it’s an unfamiliar turn in the relationship. Surrounded by jungle plants under a glass-domed ceiling four stories high, Washington and Seattle political leaders got up on a rainy January day to toast Amazon’s success and their hopes for a long-lasting partnership. But behind the bonhomie was a simmering tension between Seattle’s largest employer and city officials bent on raising more money to combat homelessness. Just 93 days later, Amazon delivered a reminder that many of its commitments are not set in stone. The tension reached full boil last week as Amazon halted planning for one skyscraper and said it would consider subleasing another, pending the outcome of a City Council vote on a tax that would charge large businesses to fund homelessness services and affordable housing. 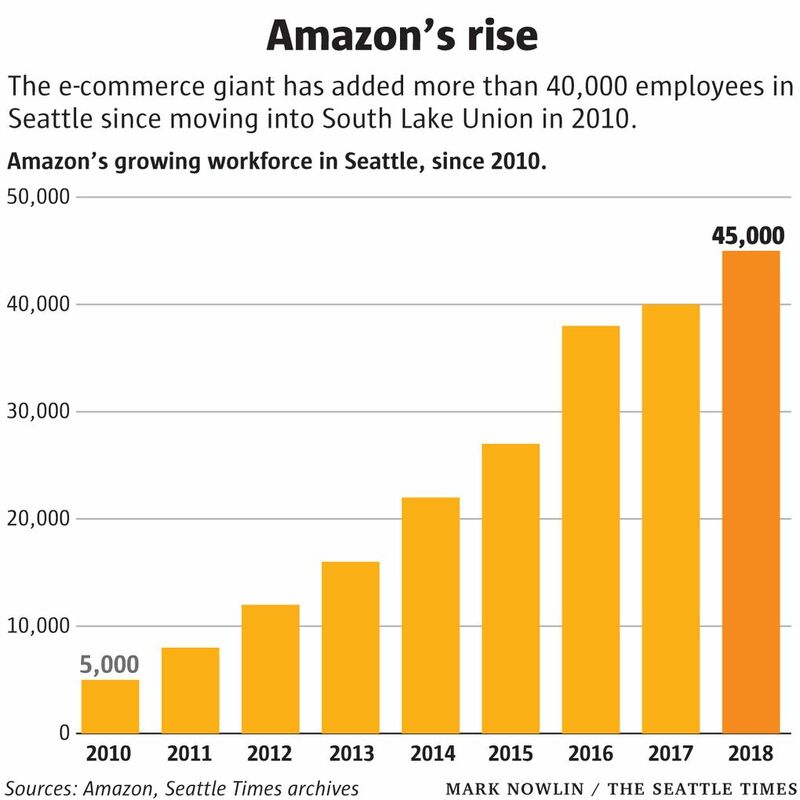 The move, Amazon’s biggest show of muscle in Seattle civic life, left many with the impression that the company, after adding 40,000 workers to its ranks in the city over the last eight years, might fully halt its growth here — or even reverse course — if the tax went through. In addition to the direct challenge to its local City Hall, observers say, the unusual public spat sends a message to the 20 regions vying to host Amazon’s second headquarters: Executives at the company, who wove a preference for low taxes into their business, won’t hesitate to curb investment if a local government tries to change the rules. Even in its hometown, Amazon is comfortable playing hardball. The current flashpoint is Seattle’s head tax, a proposed levy on companies with more than $20 million in revenue. It drew support from a majority of the City Council, and was slated for a full council vote later this month. Amazon, which had made its opposition to the proposal known to city officials through its policy staff and trade groups, this past week upped the ante. The company halted planning on a 17-story tower on land it owns in its core corporate campus, and floated the idea of subleasing Rainier Square, a downtown skyscraper under construction that the company had previously leased. Together, the buildings were scheduled to hold about 7,000 employees. “They clearly want to send a message to City Hall, that we can’t take for granted that the growth we’re experiencing is going to go on endlessly,” said Peter Steinbrueck, a commissioner with the Port of Seattle and former City Council member. The company declined to comment beyond its earlier statement confirming it had suspended some work pending the vote. 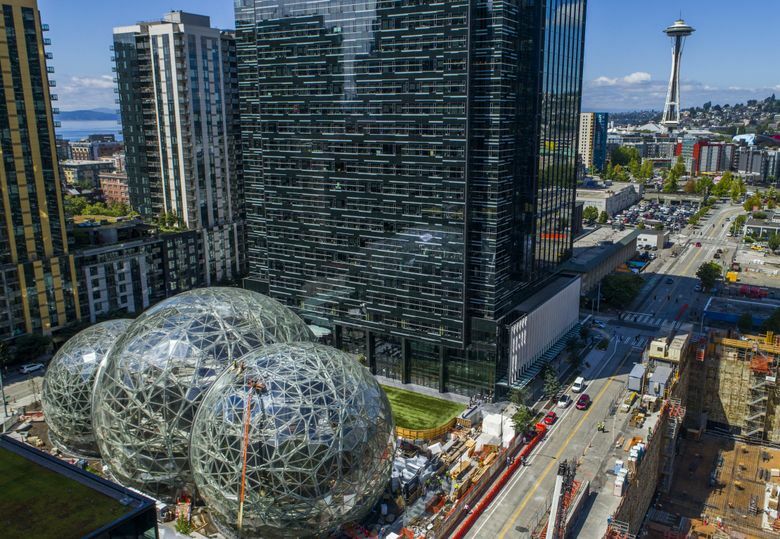 Jon Scholes, president of the Downtown Seattle Association, which works closely with Amazon on city issues, said the company’s workforce of software developers is more mobile than manufacturing-company employees or Boeing engineers. “I don’t think this is a company that bluffs,” he said. When he set out to launch his online book-selling startup, Chief Executive Jeff Bezos chose Washington in part for its small population, meaning Amazon could sell goods sales-tax-free to more populous states. The company, which moved to Seattle in 1995, a year after its founding, became one of the most disruptive forces in business by figuring out how to deliver goods and services more efficiently than anyone else. In the last decade, it came to dominate categories of online retail, and pioneered new businesses in electronics and cloud-computing technology. At the same time, Amazon has emerged as a disruptive force within its hometown, showering Seattle with about $31 billion spent on its campus and employee salaries over the last eight years. Yet it also has become a byword for a transportation crunch and the skyrocketing cost of living that has deepened the city’s homelessness crisis. When Amazon announced in September that it was seeking to build a second, “equal” headquarters, roughly the same size as its Seattle base, business and political leaders fretted that a fissure had formed between the city and company. Others were relieved, hoping for a pause in the economic dislocation that has accompanied the boom. Outside of Seattle, mayors pounced: 238 regions submitted proposals to host Amazon’s HQ2. Many complied with Amazon’s request for tax breaks and other incentives, with several cities offering multibillion-dollar packages. Supporters of the company point out that Amazon didn’t make similar public requests for funds from Seattle. For most of its first 23 years in Seattle, Amazon was largely silent on city issues, and its primary interactions with officials concerned construction permitting, transit and other issues of interest to a large landowner. The company wasn’t so hands-off elsewhere. As part of its effort to resist collecting sales tax on purchases, Amazon repeatedly used the threat of job losses, and the promise of investment, as bargaining chips with state and city governments. In one episode, Amazon laid off its workers at a warehouse in Texas in 2011 rather than comply with a state determination that it owed $269 million in back sales taxes. As the company agreed to start collecting sales tax in the following years, it negotiated deals with state governments, sometimes promising jobs and investment in exchange for a tax holiday. The precise impact of the proposed head tax is unclear. The levy’s first phase would assess about $500 per full-time employee, per year, a sum that places Amazon’s liability at its current head count at $20 million to $25 million. That changes in 2021, when the tax would convert to a 0.7 percent payroll tax. During the most recent 12 months, Amazon reported $3.9 billion in net income, and paid $1.2 billion in income tax to governments worldwide. 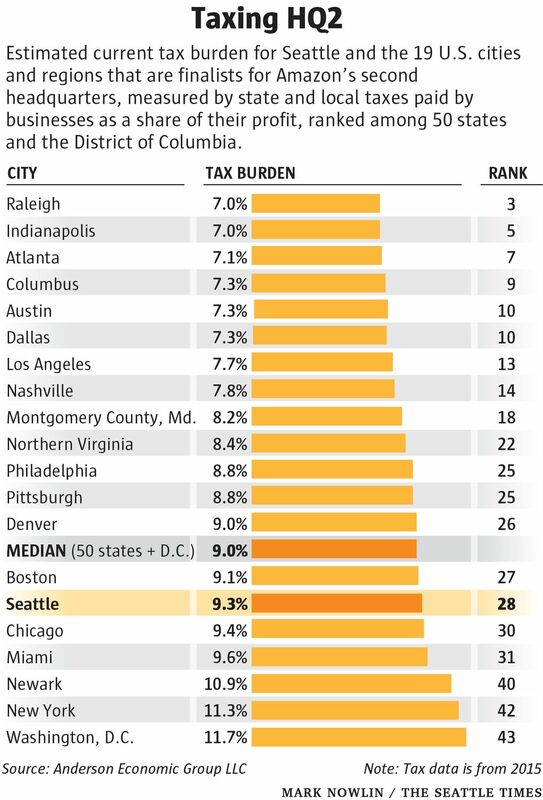 The overall business-tax burden in Seattle ranks about middle-of-the-pack nationally, according to an analysis by the Anderson Economic Group, which calculated rates based on all state and local taxes paid by businesses as a share of their profits. But of the 19 U.S. cities and regions selected as finalists for HQ2, 14 are in states estimated to have a lower burden than Washington state, according to the Chicago-based consultancy. Those rates will likely be lower still if Amazon selects one of the cities that has offered large, multiyear tax breaks. Some suspect that the direct financial impact from Seattle’s proposed tax may be less significant to Amazon than the climate that produced it. 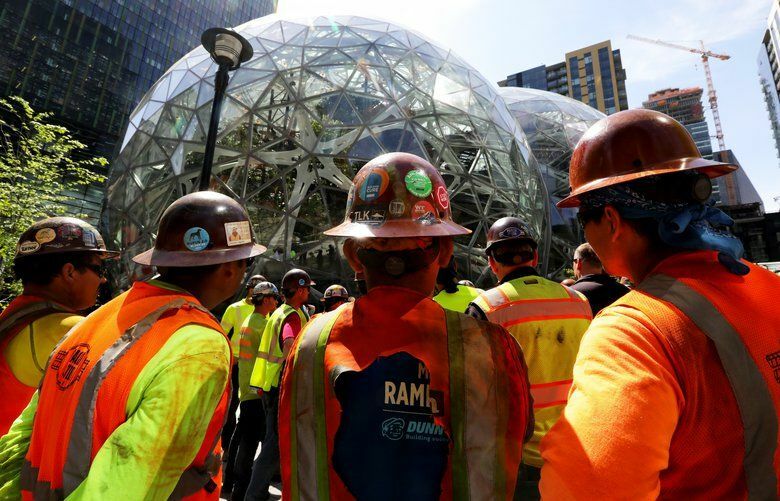 For the city of Seattle, whose budget has swelled with the fees generated by the Amazon-fueled development boom, Amazon’s workforce decisions could have far-reaching effects. Amazon entities are the largest and fifth-largest individual property taxpayers in Seattle, with a combined assessed value of $2.8 billion in 2018, according to city financial filings. Based on the regular tax rate applicable to South Lake Union, where Amazon’s presence is concentrated, those entities alone would have a combined bill of about $27 million, or about 5 percent of all the property taxes Seattle collected in 2016. This, however, is an incomplete picture because it doesn’t account for other Amazon legal entities that own different properties. It is also possible that certain Amazon holdings are subject to different rates. Amazon’s blowback also echoes a note it sounded in announcing a search for a second headquarters: the importance it places on a stable, business-friendly climate. Sam Bailey, a vice president of greater Denver’s economic-development body, has been following the head-tax debate in Seattle. Amazon’s move, he said, didn’t come as a surprise. “Communities that are competing for HQ2 are sensitive to the fact that Amazon wants some certainty,” Bailey said. Others say Amazon’s message to the contenders goes further. Amazon hopes to announce the site of its second headquarters sometime this year, and expects to place its first workers there in 2019. That gives the company flexibility it didn’t have when it started its Seattle growth spurt a decade ago. At the biospheres opening earlier this year, most of the comments by politicians were lighthearted. Mayor Jenny Durkan took a different tone, highlighting issues like homelessness, unaffordability, problems she said many cities face. “But no other city, no other city in America and I think across the globe has what we have here,” she said, referring to commitments like those Amazon was making.